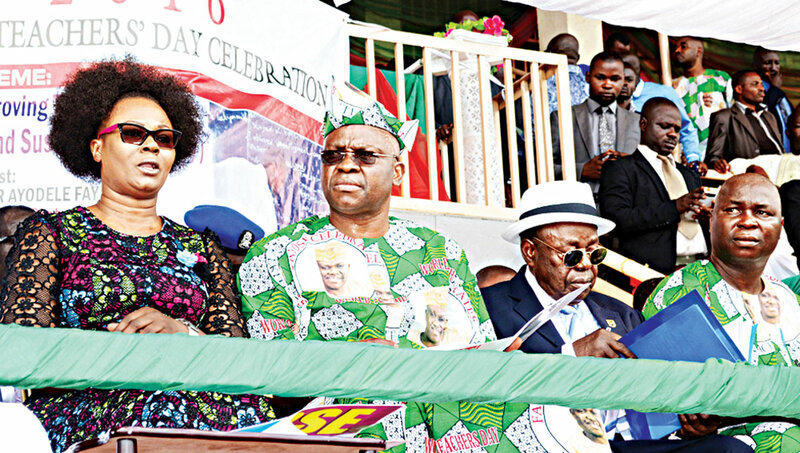 Wife of Ekiti State Governor, Feyisetan Fayose (left); her husband, Ayodele Fayose; Founder, ABUAD University, Afe Babalola and Chairman, state chapter of Nigeria Union of Teachers (NUT), Kayode Akosile, during the celebration of 2016 World Teachers’ Day at Oluyemi Kayode Stadium in Ado-Ekiti… yesterday. Governor Ayodele Fayose has donated N50 million to teachers in Ekiti State. 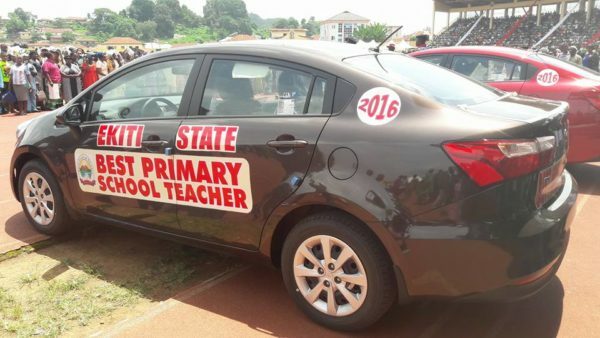 He also gave two brand new cars to best teachers in public primary and secondary schools. 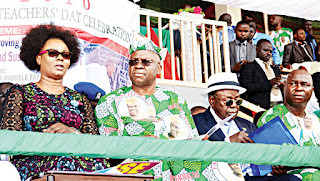 Fayose, who spoke during the commemoration of this World Teachers’ Day in Ado-Ekiti, said it was to appreciate them for making the state to emerge first in the 2016 National Examinations Council (NECO). He promised to increase the incentive to N100 million next year if the teachers could sustain the feat, adding that his government would continue to treat them with dignity and celebrate their competence to help the future of the state.